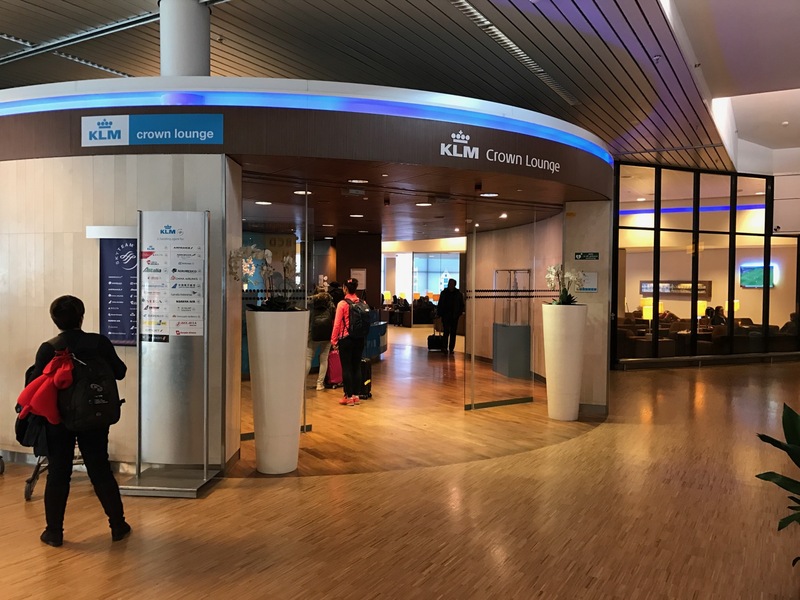 KLM’s flagship Crown Lounge in Amsterdam is the biggest business class lounge I have ever seen. The entrance does not look all that imposing, but walk in and the seating areas stretch as far as the eye can see in either direction. Walking from one end of the lounge to the other takes minutes rather than seconds. I had just stepped off my flight from San Francisco and wanted a shower. To request a shower, you must visit the central ticketing/help desk just behind the check-in desk. There, an automated check-in machine will let you choose the shower option and then spit out a claim ticket like you get at the deli when waiting. 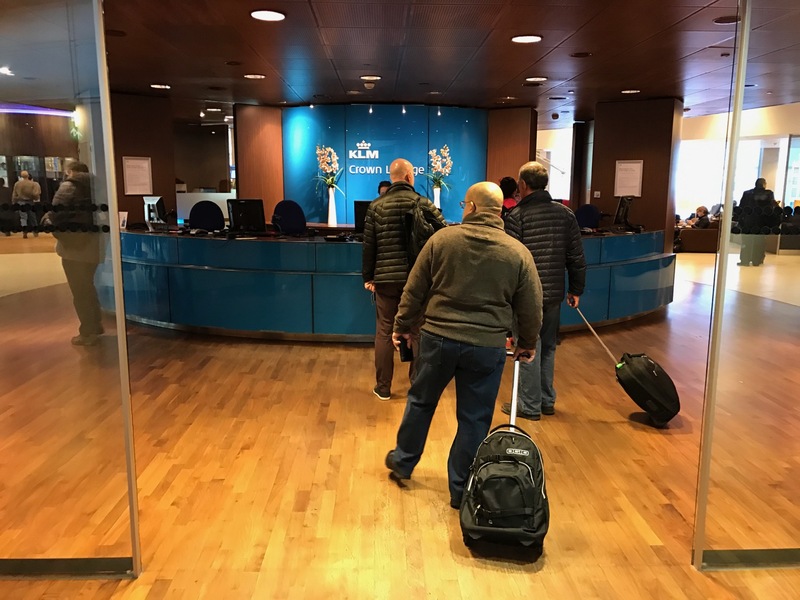 When your number is called, stop by the desk on the left and a blue-uniformed KLM employee will give you a shower key. Much like a hotel key, the cards are numbered according to your assigned shower room. I had to wait two hours for a shower. 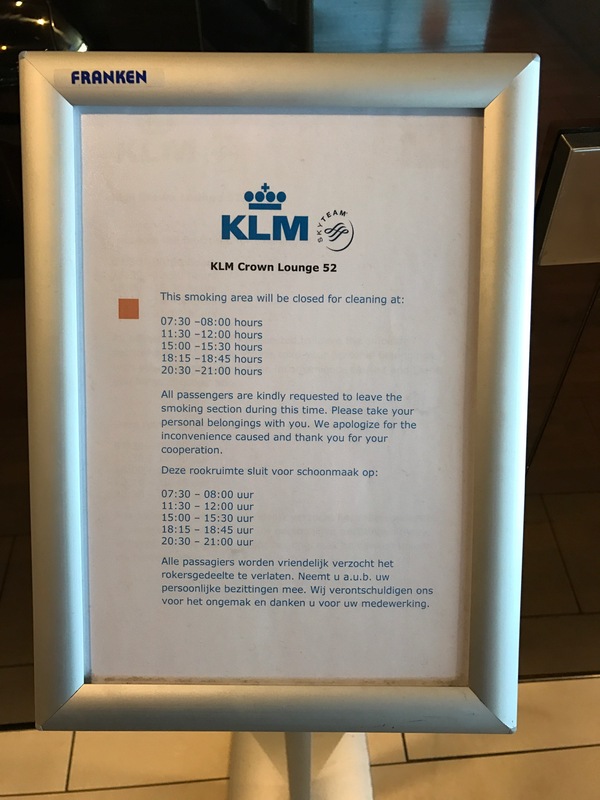 Sure, it was a very busy morning in the lounge and I had a five-hour layover so it did not really matter, but if you just have a morning connection through AMS you likely will not be able to take a shower. The shower itself was perfectly pleasant, with one annoyance. The shower rooms do not have toilets. But the water was hot. I mentioned that the lounge seems to stretch on and on. Arranged in an L-shape with two long wings, there was ample seating despite tremendous crowds. All plugs are European style but converters are available should you require one. The lounge did empty out around 1pm. 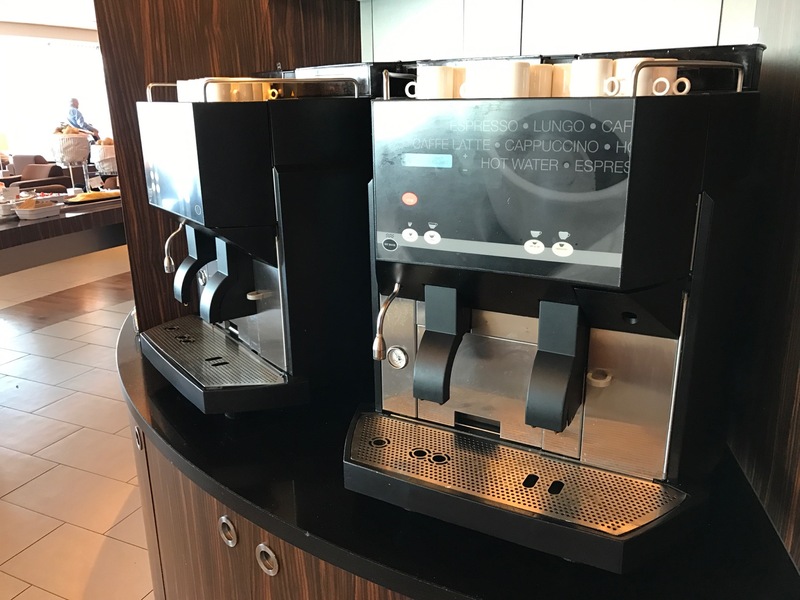 While the lounge has a nice selection of drinks — coffee, alcoholic, and nonalcoholic — the food selection is weak. Cold cuts, breads, salads, cheese, cookies, and whole fruit. It’s not much, but enough for a snack. 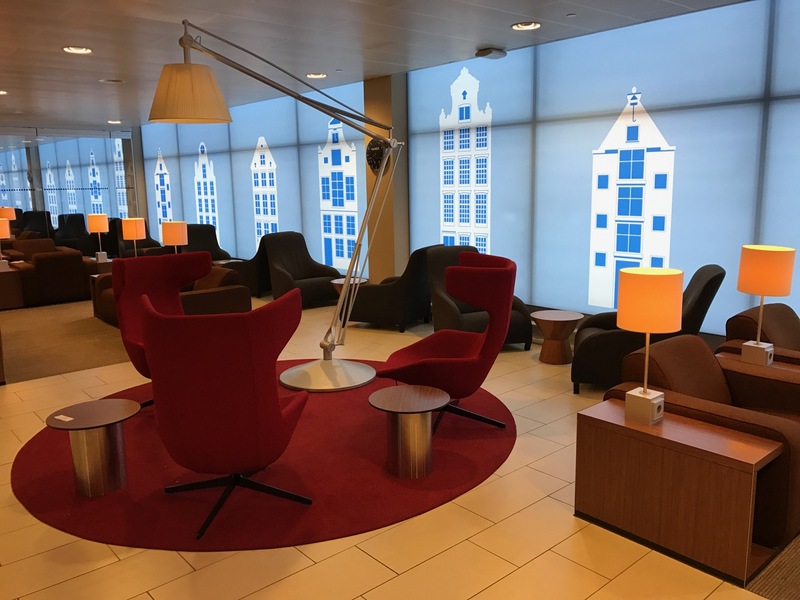 The only reason I mention the smoking lounge is because KLM has a large one and I certainly heard about it with frequent PA announcements during my visit. 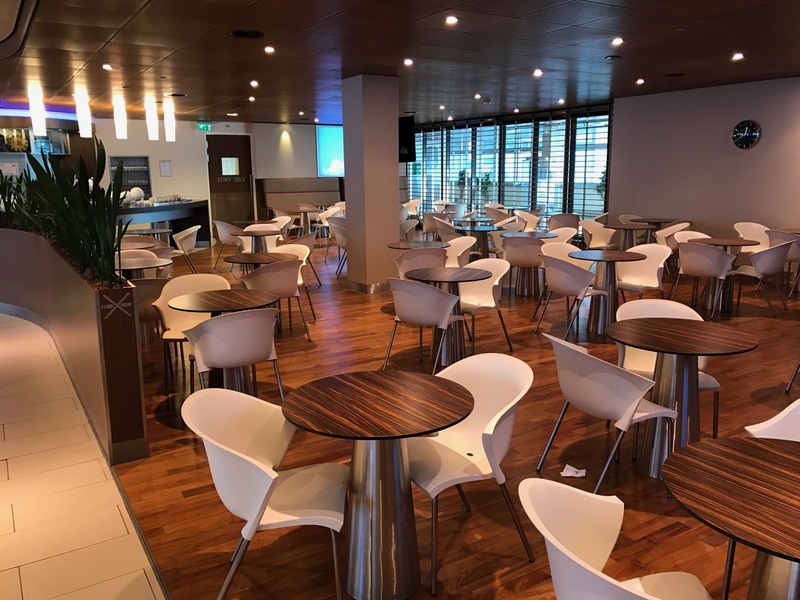 The lounge closes at intervals throughout the day, perhaps by law, in order to clean it. Smokers were herded in and out during my visit. For any pot smokers…I saw no signs saying cigarettes only. 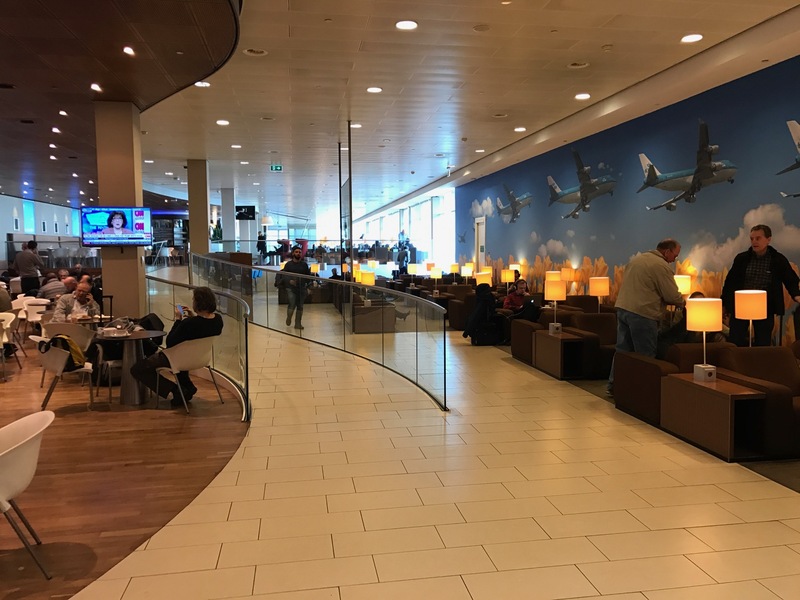 There is nothing special about this lounge–it is a huge lounge for a huge airline in a huge airport hub. But is functional and certainly better than the AMS gate areas. Internet was fast and I was quite productive during my visit. Thanks for the helpful review. I’ll be flying IAD to AMS in business and my connecting flight is in economy. (Delta award ticket) Any idea if I’ll be able to access the lounge? Technically, you are not entitled to access unless you have SkyTeam elite status. But it won’t hurt to ask! Unless the lounge is fully packed, they granted you the entry. 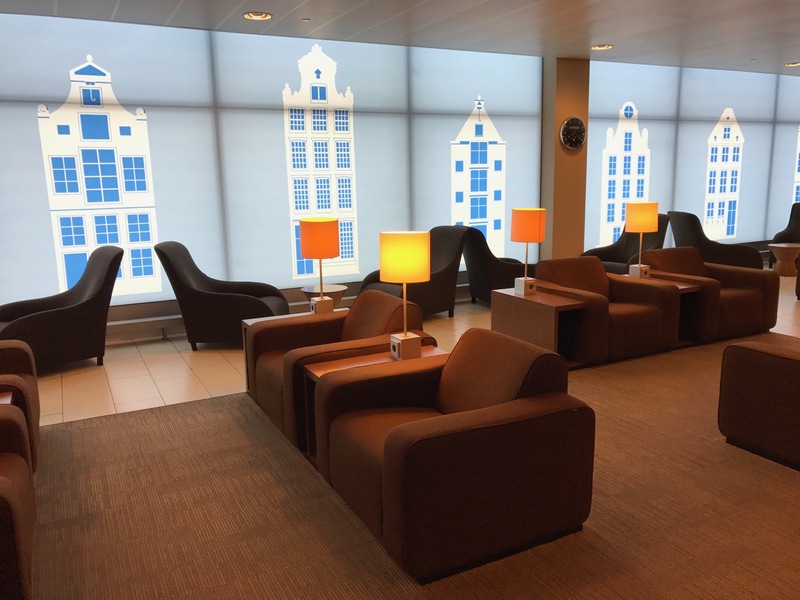 I usually travel business for long haul and then economy for Schengen, and they always let me use the lounge during the stop over. 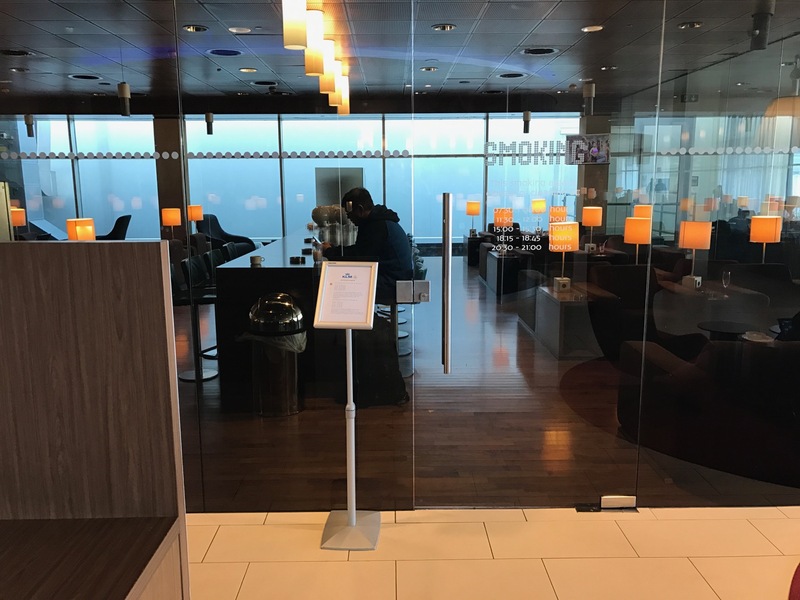 KLM Lounge 52 in Amsterdam has a number of drawbacks. It’s very crowded and loud. There’s such a long wait for a shower, that you won’t bother. The women’s bathroom was a horror. On the trip in, I made an allowance that it was jus a bad day for staff that the bathroom was dirty and that it stank. Stuff happens and I figured it was an anomaly. The trip back, it was actually worse. The counter space was floored. There was a broken, hanging wastebasket. It smelled worse than the trip in, ten days ago. 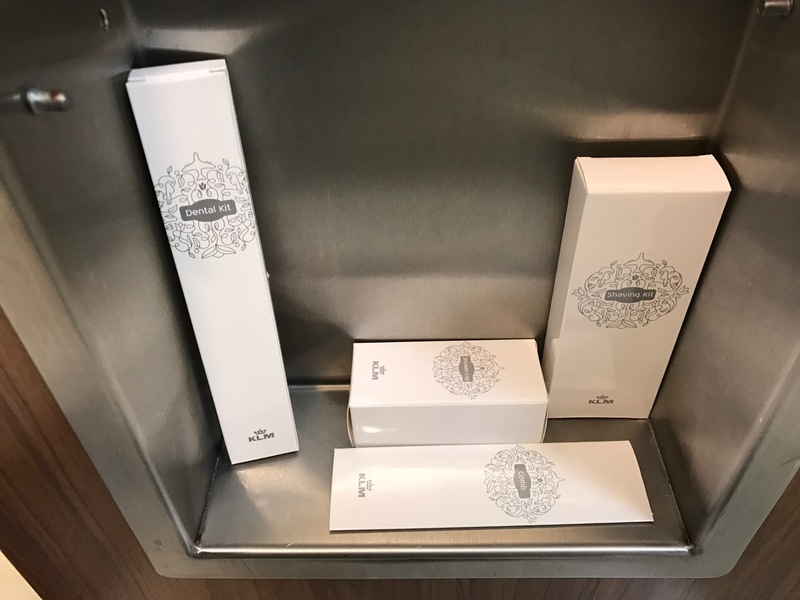 The women’s toilets have no shelving and the floor was dirty, making changing difficult. Worst of all, the only means to dry your hands are a series of cloth towel machines. The cloth was ripped and was stained from prop users. Really a very bad experience. Was at this lounge a few weeks ago. Good summation. But regarding the food, I was there around lunch and I has some hot pasta, I recall of the bowtie variety. They also had soup. Not great, but just tipping the scale from snack to meal. I was there from 10am-3pm and did not see any pasta. Was it at all food stations or just one? I only examined and consumed from one, the one when you veer right after you enter the club. 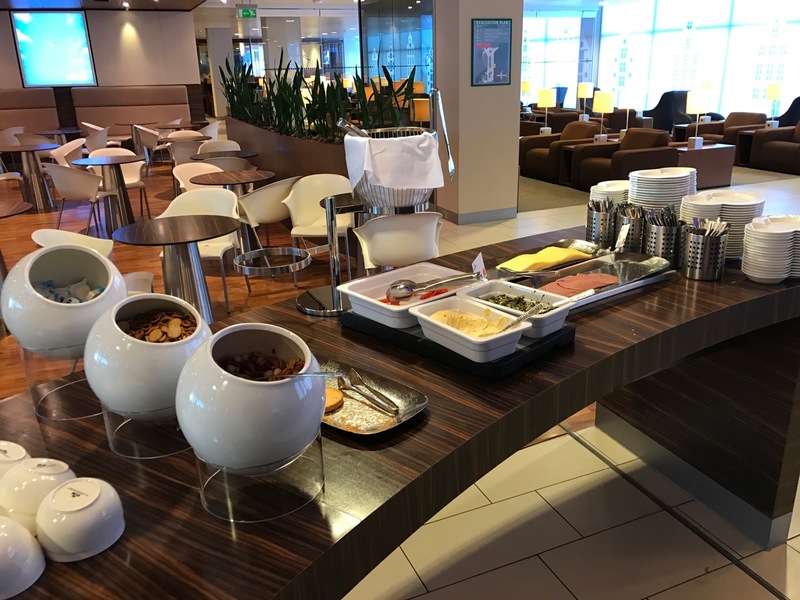 Compared to Emirates Lounge, this is nothing!